Yesterday, Microsoft introduced two new “Surface” tablets: One ARM-based version and one Intel-based version. This blog post summarizes the introductions and mentions a few thoughts of mine. 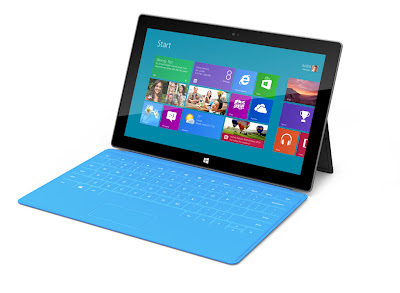 Microsoft’s Surface Tablet with the Touch Cover. 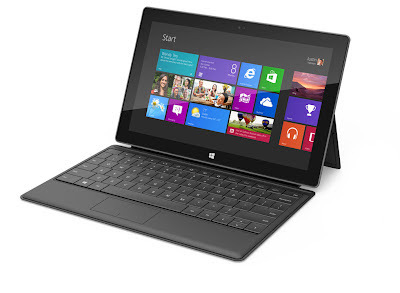 Microsoft’s Surface Tablet with the Type Cover. Pricing will be announced closer to availability. The Windows RT model will be available at the same time as Windows 8 (probably October). The Windows 8 Pro model will be available three months later. And this is one high quality kickstand. It's an integrated part of the system's shell. It fits flush when closed, feels sturdy when opened, and makes a reassuring click as it settles into place. It apparently took dozens of iterations to get the right sound. It does a good job of propping up the screen. Touch cover: The cover is one big pressure-sensitive touch surface. However, it should be much more fun to type on that glass, because it will have a structured surface. Touch-typing seems a definite possibility. Type cover: Thicker, but with a real keyboard. Both covers include a trackpad which I think is a good decision (read more here: ). It’ll be interesting to see how the Surface’s 16:10 aspect ratio works out compared to the iPad’s 4:3. In my experience, 16:10 works well for phones, but less so for tablets. Tablets feel a bit strange when used in portrait mode (which I prefer on the iPad). I’d be worried about the stand breaking, but Ars Technica’s Peter Bright thinks it’s sturdy, so that might not be a problem. Offering a pen is nice. Alas, it’s only available for the Intel model. Apple really should offer its own pen. There doesn’t seem to be a model with built-in cellular connectivity. I’m not too fond of the fairly generic name “Surface”. At least it’s not worse than “iPad”. Furthermore, the word “vapor” (as in VaporMg) is firmly associated with Vaporware in my mind, but that may be a software engineer thing. Why are there two versions with completely different hardware architectures? They are currently not even distinguished by different names. At least they roughly run the same operating system. I don’t understand why Microsoft chose to give the ARM port of Windows 8 the name Windows RT. The official Surface website is only so-so. I find its structure and language confusing. For example: Why is the spec sheet only available as a PDF? Apple usually does a better job of explaining its products. Why doesn’t Microsoft tell us the screen resolution? It must already be fixed by now. Ballmer let us know that hardware partners were indeed made aware of this announcement in advance of the event today. [...] When pressed on what he thought Microsoft could bring to the table that other hardware-makers couldn't, Ballmer demurred, but he did say part of the Surface's purpose was to "prime the pump" for the coming release of Windows 8. [...] Surface is "an important companion to the whole Windows 8 story. It's an important piece; it's not the only piece."